The Kentucky Derby has been held at historic Churchill Downs in Louisville, Kentucky since 1875. The “Fastest Two Minutes in Sports” is the most prestigious horse racing event in the United States, filled with celebrities, big hats and mint juleps. Below you will find a detailed Churchill Downs Seating Chart that includes a breakdown of the different sections, the best seats at the Kentucky Derby, infield general admission details, Dresscode and What to Wear at The Kentucky Derby and everything in between. Plus, you can purchase No Fee Kentucky Derby Tickets from TickPick, the no only fee ticket marketplace. The Grandstand Seating at the Kentucky Derby is all bleacher seating, and contains sections 119-128, 221-225, 321-328. Aside from the Infield, these are the cheapest seats at the Kentucky Derby. Cheap of course is a relative term when discussing Kentucky Derby tickets, so prices range from $300-$800 dollars, depending on how close the section is to the Finish Line. Unlike other seating areas, you cannot move to other sections of Churchill Downs with Grandstand tickets. The last 3 rows in sections 221-225 fall under the overhang of the 300 level box seats, which is a nice to have in case of rain. The 300 level Grandstand has true seats, not bleachers. Because of this, as well as the elevation these seats give you from the track (a must to see over the big fancy hats and the rest of the track), these seats are more expensive than the 100-200 level seats in most cases. There are seats in the 300 Grandstand Club level that are both uncovered and covered with sections 321-325 mostly covered (aside from first 3 rows) and sections 326-328 completely uncovered. 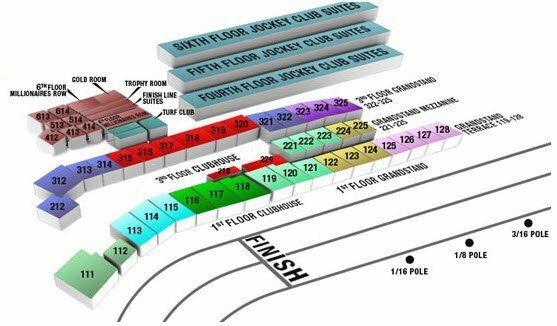 The Clubhouse seating at the Kentucky Derby contains sections 111-119, 312-321, and Mezzanine sections 212, 218, 220. The Clubhouse seating is positioned much closer to the Finish Line, Winner Circle, and the First Turn. Unlike the Grandstand, the Clubhouse has full seats in boxes, which typically contain 6 seats. There are eight seat boxes in the 3rd floor Finish Line area, which are some of the most expensive seats at the Derby. The 3rd Floor boxes gives the best view, including better amenities (more bathrooms and better food and beverage options), but the 1st floor is more festive and lively as it is closer to the track. What is unique about the Clubhouse seating at the Kentucky Derby is that you can always move down from your level or floor. For example, if you have a ticket to the 3rd floor, you have access to the 2nd and 1st floors including Grandstand sections as well. The Infield General Admission tickets at the Kentucky Derby is where the party is at. The crowd is mainly college students, coolers are permitted, and around 100,000 people pack in to one of the best day drinking events of the year. The famous mint julep isn’t exactly cheap, so many opt to pack coolers full of beer to go along with their $40-$65 dollar ticket. You can’t see the race from the infield, and by the end of the day most of the grass has turned to mud. If your worried about your fancy hat getting muddy, this is the absolute worst place for you. The Millionaires Row and Sky Terrace at Churchill Downs was completely renovated in 2004, separating Millionaires IV and Millionaires VI. Post renovations, the sections not claimed by the Millionaires tag have become the Sky Terraces, specifically sections 412-414, 513-514, and 613-614. These are the area’s filled with celebrities, and the prices certainly reflect that. The seating in these areas is 8 per table, which includes waiter/waitress service and access to full bar. In order to view the races these area have access to a balcony overlooking to the track. Millionaires row boasts a more modern feel with more TV’s, is set up like a large dining hall, and is positioned with a more direct view of the finish line. The Sky Terrace is more of a long, narrow room with two rows of tables, situated beyond the finish line at the cusp of the first turn. The Turf Club at Churchill downs is of course a private club for members only for the Kentucky Derby, but tickets can still be had at a premium. The tables in the Turf Club seat six and four, and the room is located on the 3rd Floor Clubhouse just above section 317 on the wire. Amenities include an upscale buffet but drinks are not included. This the most luxurious seating at the Derby, and a Turf Club ticket grants you access to any other area at Churchill Downs. The Matt Winn Dining Room is very similar to the Turf Club, with a bit less luxury and a lower price tag. If you have any questions ask in the comments below, email us at [email protected], or call us at 845-538-4567!